We have 2 main options available to us in order to store data while using PhoneGap framework. One is SQL Lite database another one is local storage / session storage. In your code you provide database name, version, display name and size. After database is created / accessed you get back database object and do interaction with it via db.transaction() method. For more information about SLQ lite implementation in PhoneGap projects check the documentation page. Session storage is similar to the local storage but data gets cleared after each browser session (once browser stops running). And now once we have this value stored our application can ask jQuery to update search text input field on application start. How to use native controls in PhoneGap mobile applications? By using PhoneGap local storage API we have started to actually interfere with the native elements of iOS (in our case this was data stored within the WebKit component). How PhoneGap does that? And how can we add some native controls like navigation bar on top of our view? In our tutorial I will not make you code in Objective-C and we are going to use plugin which I wrote few weeks ago inspired by couple of other PhoneGap native iOS plugins out there. This plugin has 6 files and below are the instructions where to import them. Remaining NavigationBar.js file goes into our projects main js folder. You can find and download all above plugin files from the GitHub repository. // Cordova framework sends us. There are additional functions in the code to handle button clicks and I’m using the session storage (remember, we just talked about it earlier) to keep the track on which page mobile application user currently is. 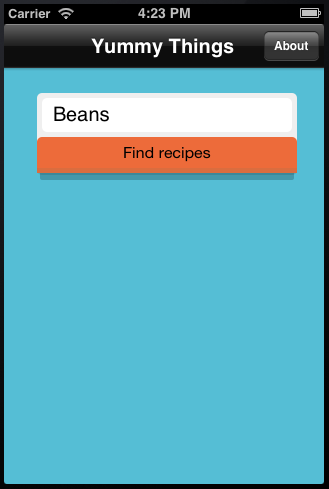 After compiling and launching Yummy Things application in the simulator we have navigation bar and the about button in place. These are native controls, the same you get while developing mobile application natively. With this bit done we are now closing to the end of these tutorial series with only the last part left. You can progress to the last part of tutorial, where I’m implementing Geo location API, delayed splash screen, mobile application launch icons and talking a little bit about PhoneGap application debugging and architecture. I’m always looking for comments and suggestions, if you have any leave them in the comments under this post or get in touch directly. As always you can get most recent tutorial source code in the compressed format. Have fun! hey Frederic, this line is commented out because it would run every time page is reloaded (this will happen with each button click). We don’t want to auto set “page” value to index every time as About page would get incorrect nav bar buttons.